Series 2003 Bicentennial $2 Federal Reserve Notes! The portrait of Thomas Jefferson is on the face of this note, and a portion of the painting THE SIGNING OF THE DECLARATION OF INDEPENDENCE appears on the back. 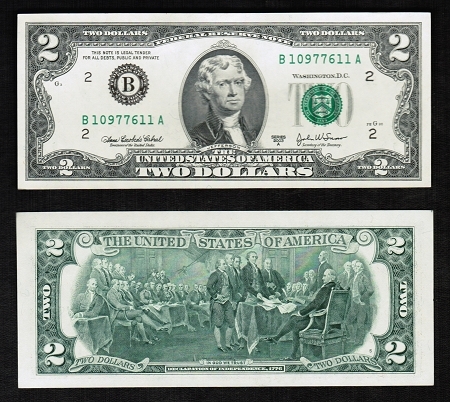 With green Treasury seal and serial numbers, the Production of these notes are the lowest of U.S. paper money: under 1% of all notes produced are $2 bills. Conditon: Note will be in crisp Uncirculated GEM Condition.